Award winning news, commentary and opinion on workplace health and safety. 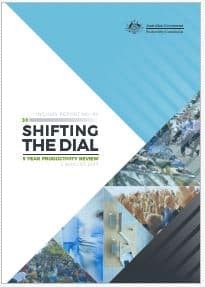 Australia’s Productivity Commission (PC) released a 5 year productivity review called “Shifting the Dial“. It is one of those large government reports from which lots of people draw lots of conclusions. Chapter 3 in this report addresses Future Skills and Work within which occupational health and safety (OHS) is mentioned in a useful and important context. Login or subscribe to SafetyAtWorkBlog to continue reading. © Workplace Safety Services P/L (ABN: 68091088621) and SafetyAtWorkBlog, 2008-2019. Unauthorized use and/or duplication of this material without express and written permission from this blog’s author and/or owner is strictly prohibited. Excerpts and links may be used, provided that full and clear credit is given to Kevin Jones and SafetyAtWorkBlog with appropriate and specific direction to the original content. By entering your email you will be notified of any new SafetyAtWorkBlog articles. Click the link below to subscribe to exclusive SafetyAtWorkBlog articles and other information with a monthly or annual payment option. Click to submit confidential information to SafetyAtWorkBlog. Did you know that SafetyatWorkBlog is a top blog! In fact there are currently 13 readers online and a total of 16587 readers this month!